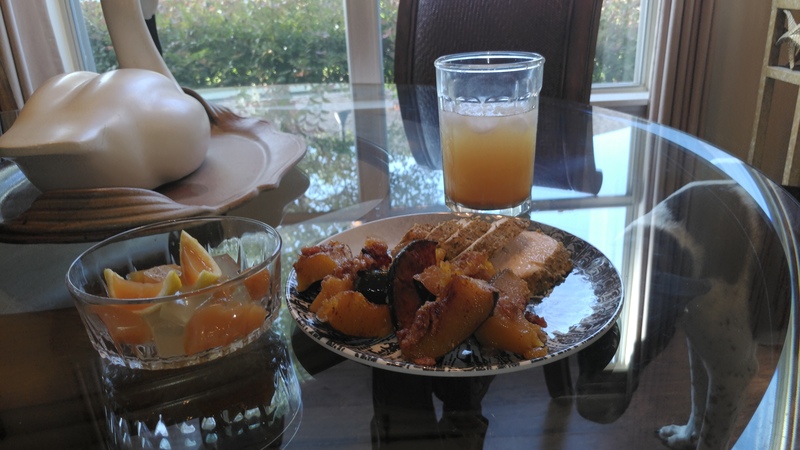 The Something Awful Forums > Discussion > Goons With Sporks > ISCA 68: I'll have what Arnold Palmer's drinking. 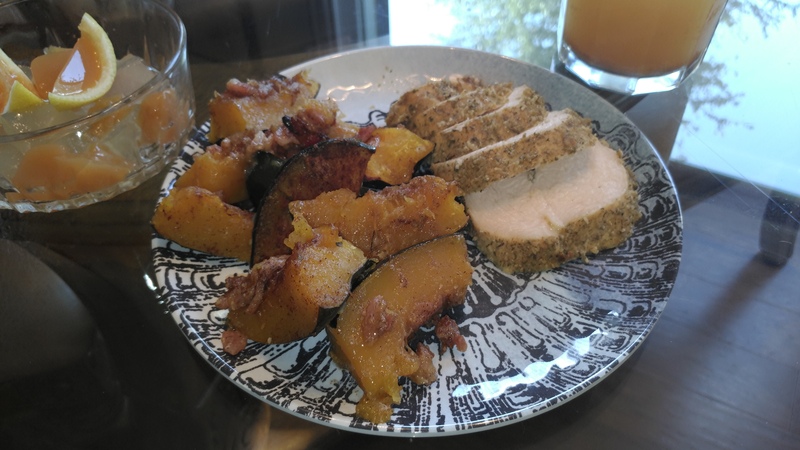 Lemon Herb Crusted Chicken with Bacon Lemon Pumpkin Spice Acorn Squash, Arnold Palmer Gelatin, and Lemon Ginger Sweet Tea. Okay, nm, those bad boys are gonna be green for a few more months. Hmm. 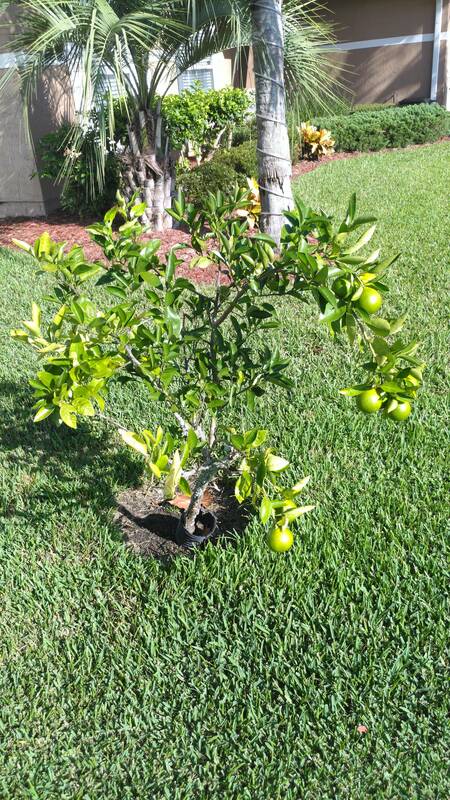 What else does Florida do better then everyone else besides citrus? First thing's first, I am thirsty. 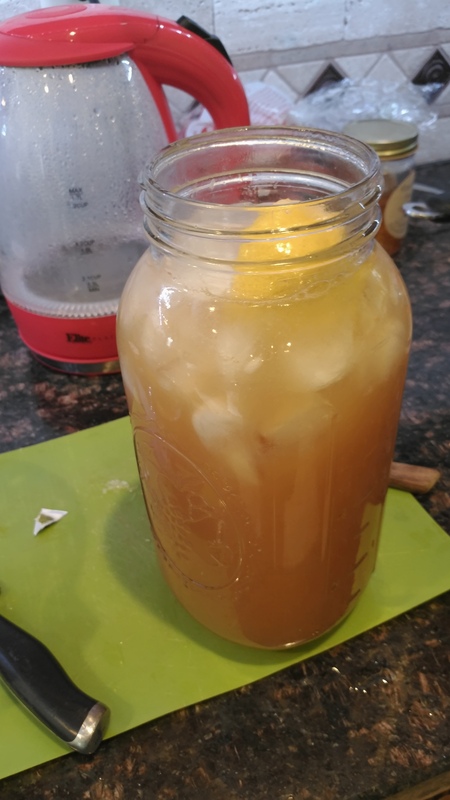 And this is the south, so of course I am going to make me a big ol batch of sweet iced tea with lemon. Some people dont like lemon in their sweet tea. Some people are ding dang idiots. Put your 3 tea bags of choice / whatever you could find in 1.75 cups of boiling water, and steep for 5 minutes. 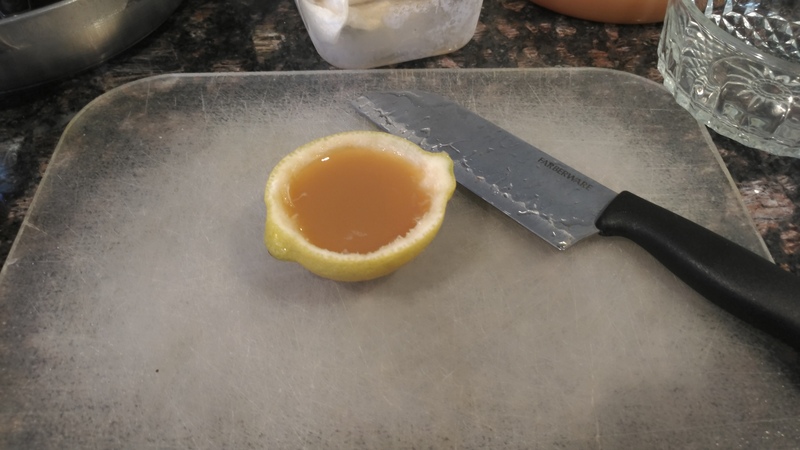 Add the juice of half a lemon, and honey to taste. Then double the honey. This should give you an almost undrinkably strong tea concentrate. 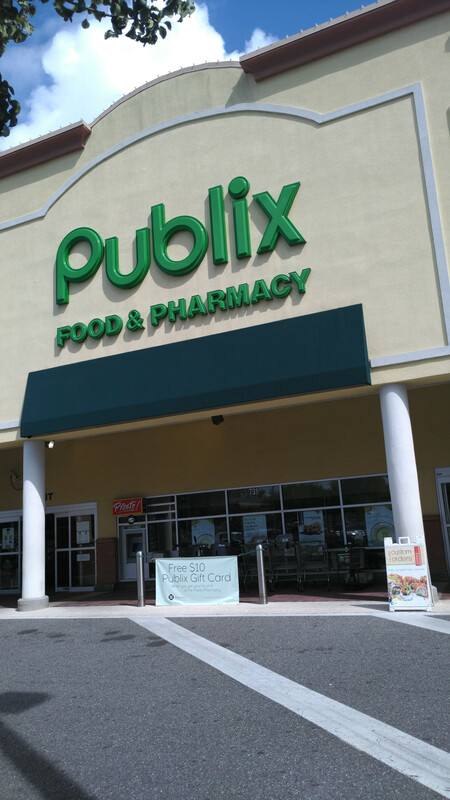 If you're planning on taking a rest in the shade while you digest your Publix Chicken Tender sub lunch, dump this hot boy over a giant glass of ice, and enjoy. If you need to make a desert for a cooking challenge, read on! 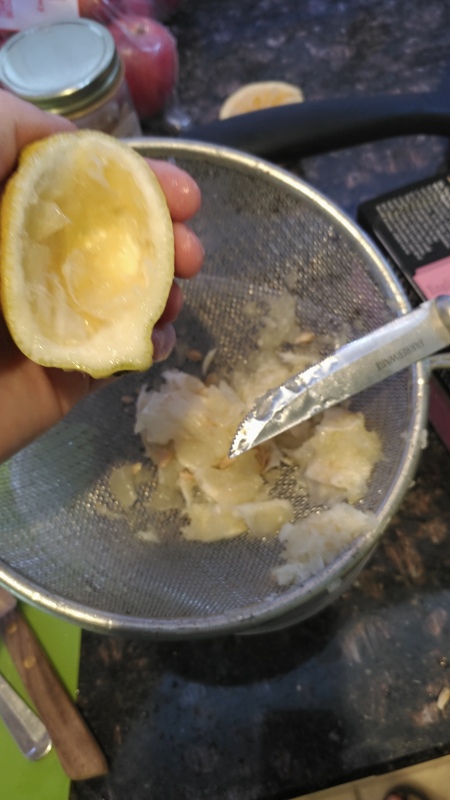 Use a serrated steak knife to cut and hollow out two lemons over a strainer and catch basin (gotta save those juices). I tried a grapefruit knife, grapefruit spoon, sharp knife, and finally settled on the serrated steak knife. It gives enough I found it was best not to squeeze the lemons beforehand, they need that firmness for the manhandling you're gonna give 'em scooping out their insides. 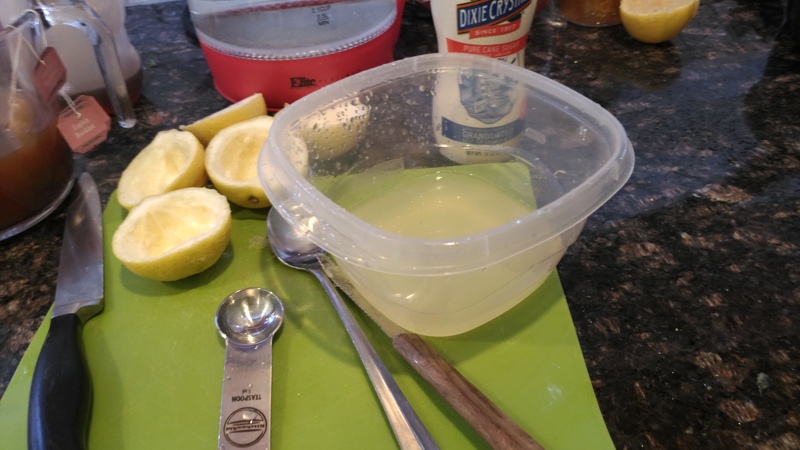 Give the strainer a bit of a rinse with water into the catch basin, and you should have about 1.75 cups of very sour but slightly diluted lemon juice. 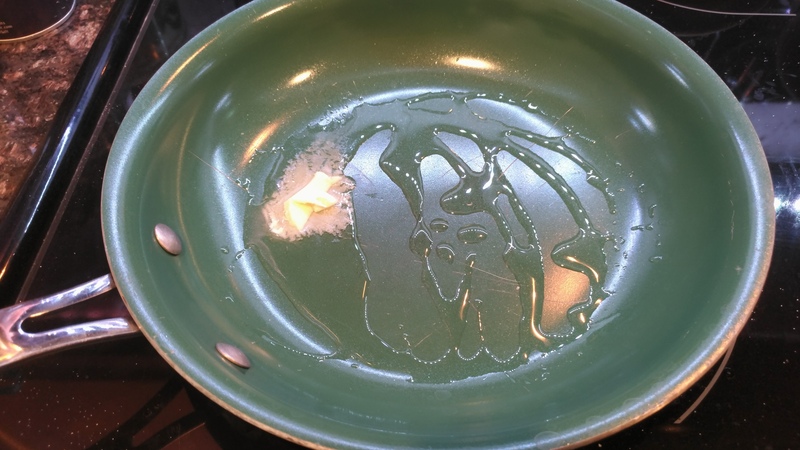 Bloom 1 packet (1 tablespoon) of gelatin in a shallow dish with a 1/4 cup cool water. Put strong tea into saucepan, and warm back up to slightly-too-hot-to-drink temperature. 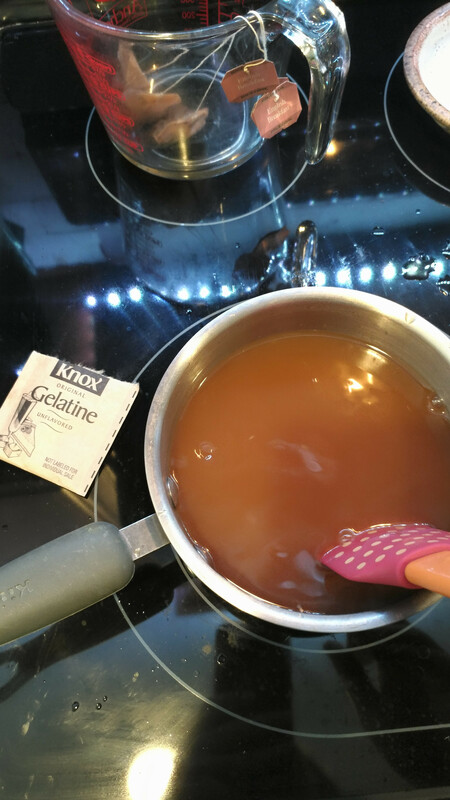 Add gelatin and cool water, stir to dissolve. 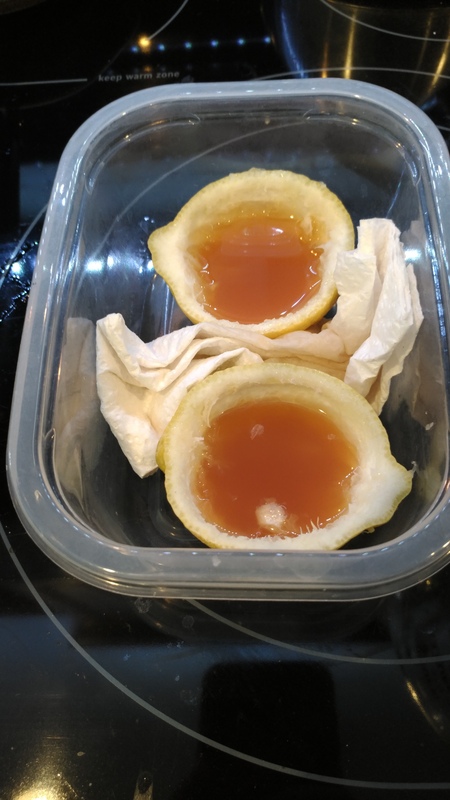 Ladle into hollowed out lemon skins propped up in a Tupperware, using a rolled paper towel to support. 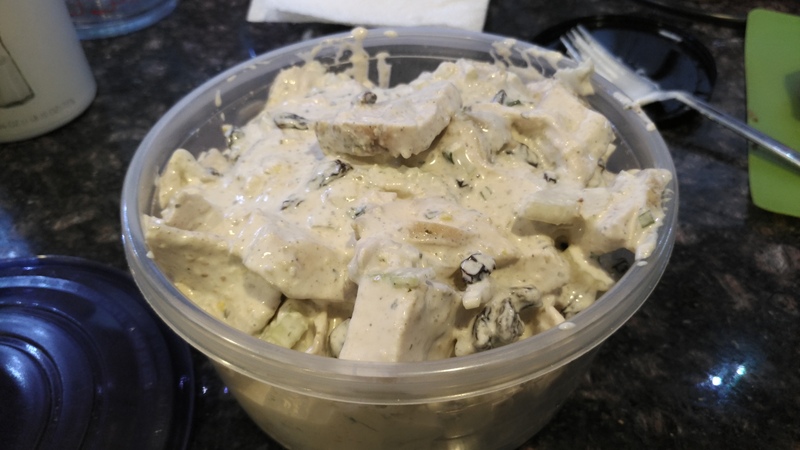 Pour leftovers into Tupperware. 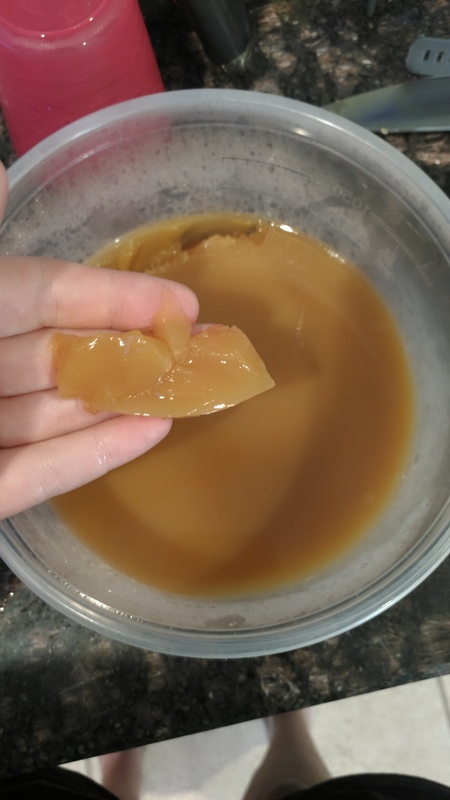 Place in fridge for 3 hours, and pray to gelatin gods that it sets because this is your first time doing this. 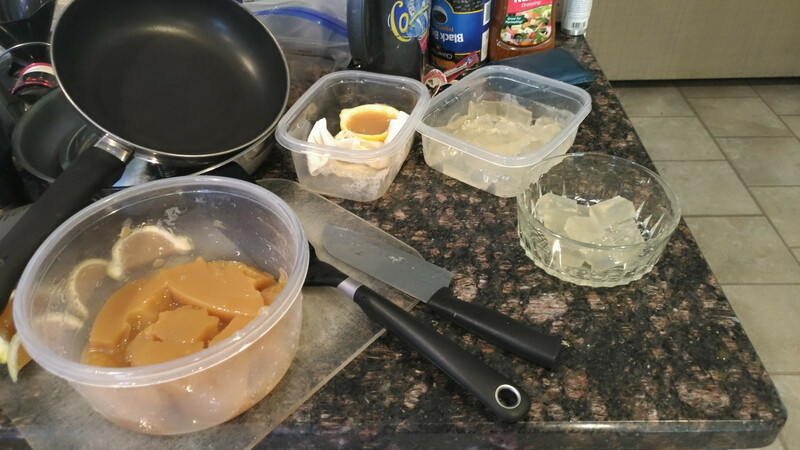 Forget how long gelatin takes to set, abandon ideas of doing a multi-layered gelatin. 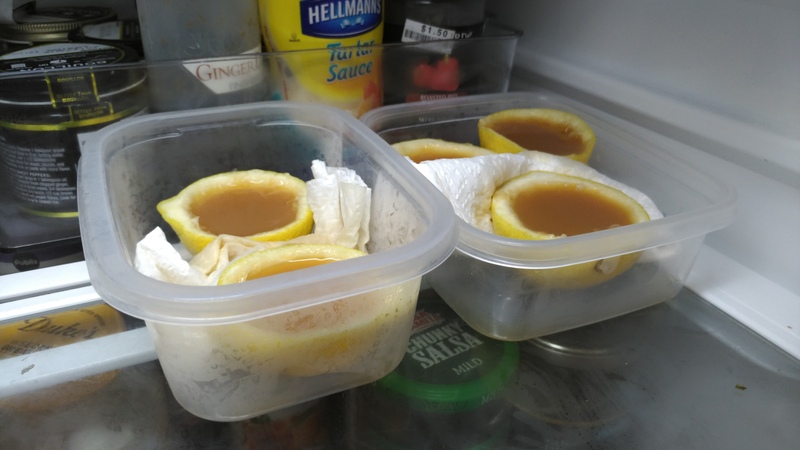 Make lemonade gelatin using same steps as the tea jelly, pour into spare Tupperware. 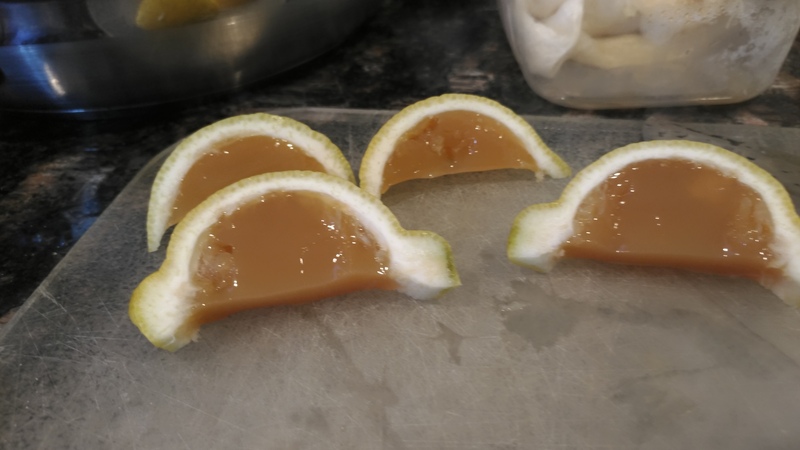 Tis a tea jelly! And tasty. It got a lot less strong in the setting and cooling. 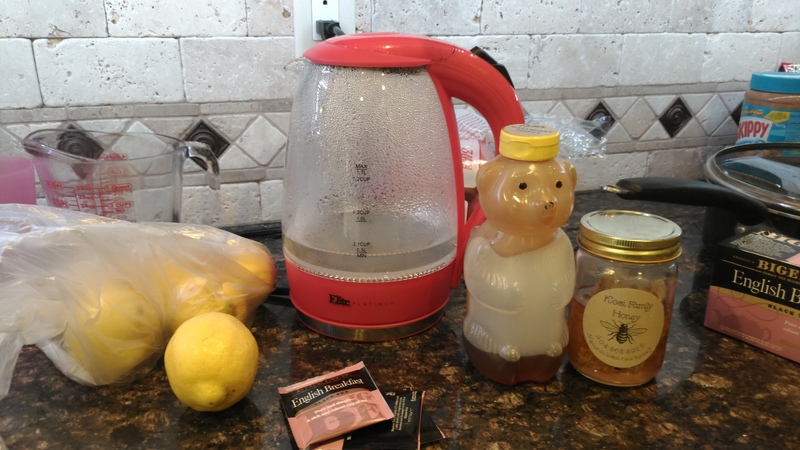 Basically, just make lemon iced tea again, with less or no sugar, and dump three packets of Prince Of Peace Ginger Honey Crystals. 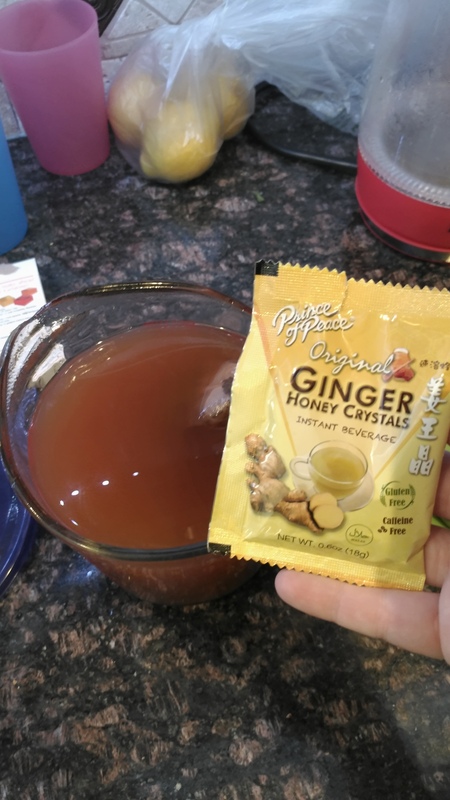 From the same people that make Tiger Balm, this is a VERY STRONG instant ginger drink. I keep some in the truck at all times in case of stomach upset or ginger cravings. Good hot or cold, but it does need to be warm to dissolve thoroughly. 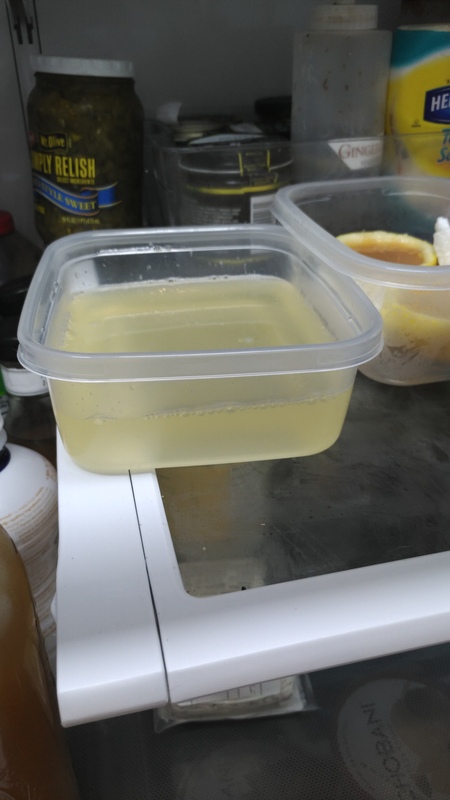 Dump over a gallon jar full of ice, refrigerate because you have more stuff to do. I was going to do a whole roast chicken. I really wanted to. But I am currently freezer rich, and cash poor. 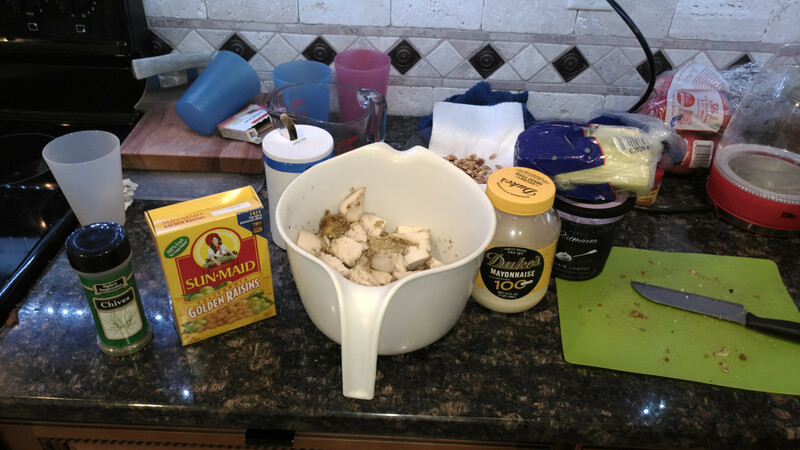 Whole chickens were not on sale at Publix today, and I have a bunch of boneless skinless chicken breast I bought on sale that it taking up a LOT of freezer space. So it gets used! 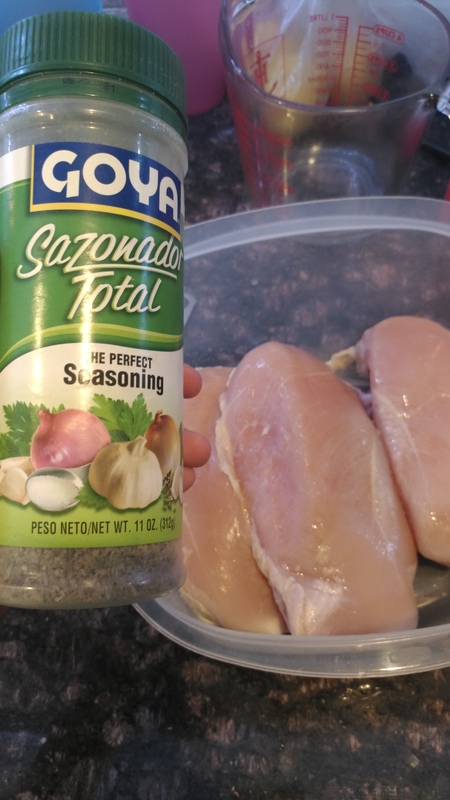 Defrost chicken cutlets, coat liberally in this magical mix of culinary cheating. It's got everything, but put it on. Juice a lemon on top. 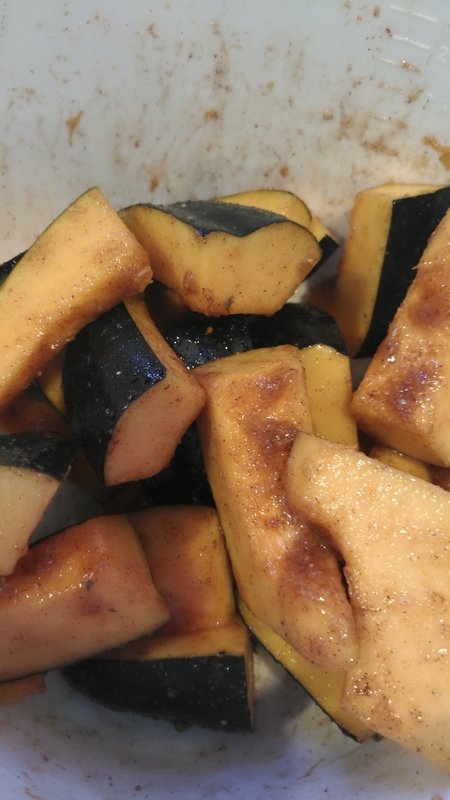 This WAS on sale at Publix, and I have also been wanting to try Acorn Squash. And it's a good thing I did, because I discovered a Cool New Thing. 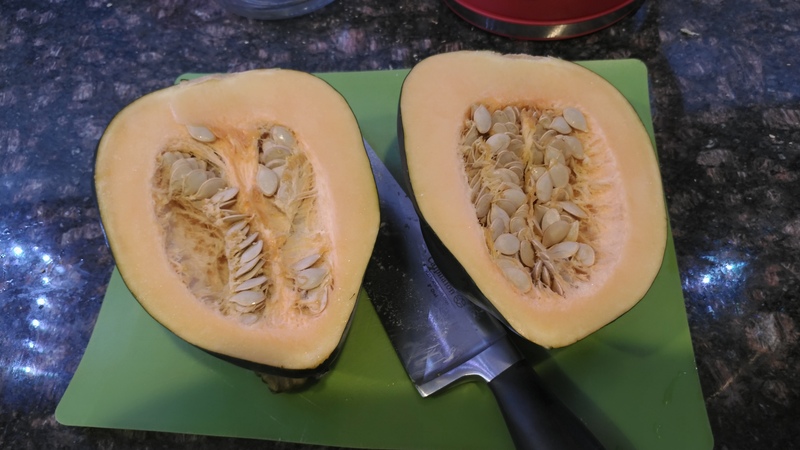 Scoop seeds out with a spoon, and separate from membrane. It's gonna take a bit of scrubbing and squeezing to get to this state, they are a bit of a pain. But ultimately worth it. 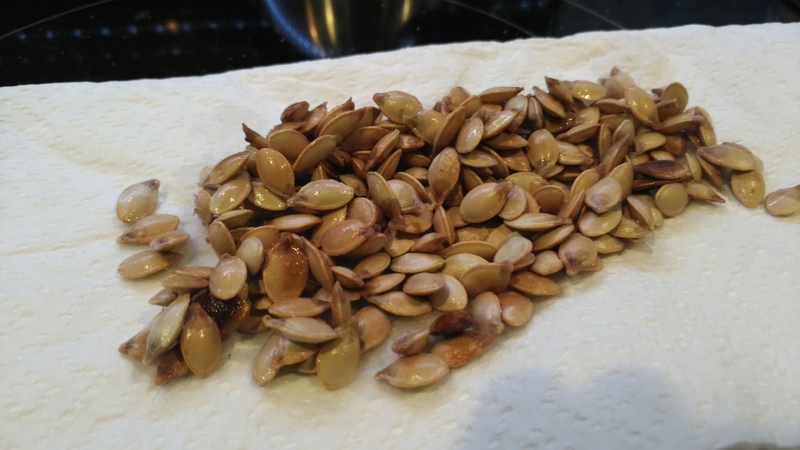 Once de-membraned, scrub with some salt, and set to the side side on a paper towel to air dry. 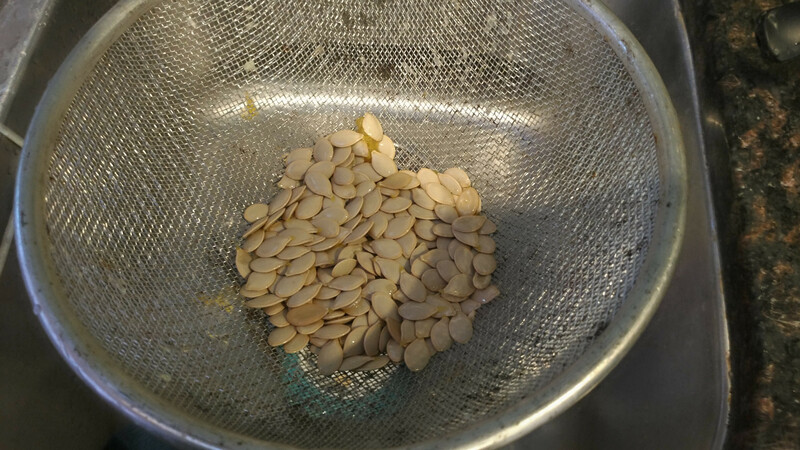 Slice squash into forkable slices (like, two bites worth), put in large mixing bowl. 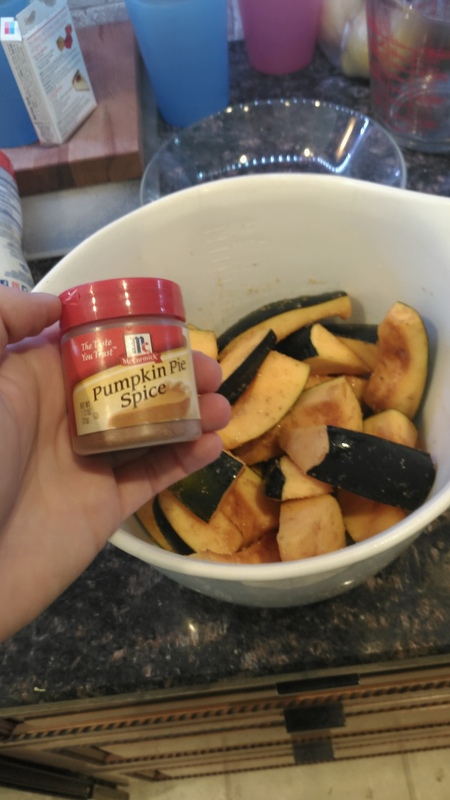 Salt liberally, add a tablespoon of brown sugar, then sprinkle some Pumpkin Spice of questionable age on top. It mostly just smells good. 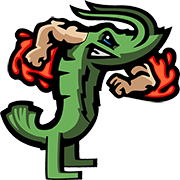 Let the salt do it's thing and draw out the moisture. Add about a slice of thick cup bacon, minced. 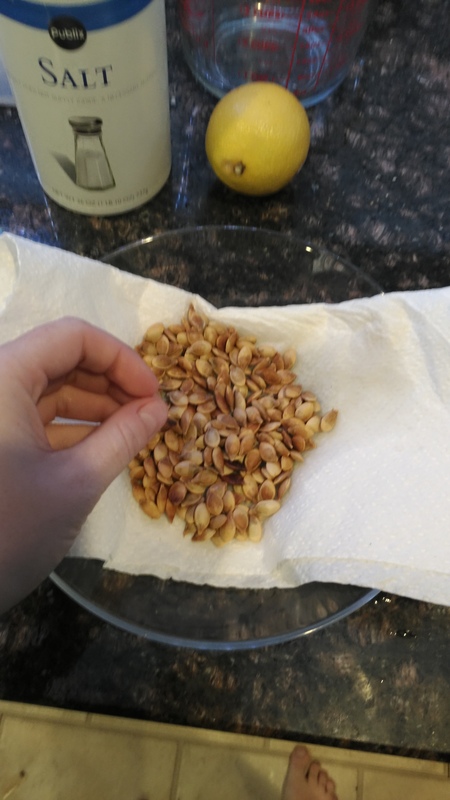 Drain on paper towel and try not to eat the whole bowl. Give up, pour a glass of ginger tea, enjoy delicious snack. It does not have lemon, and therefore does not count for the contest. But hot drat are they good! 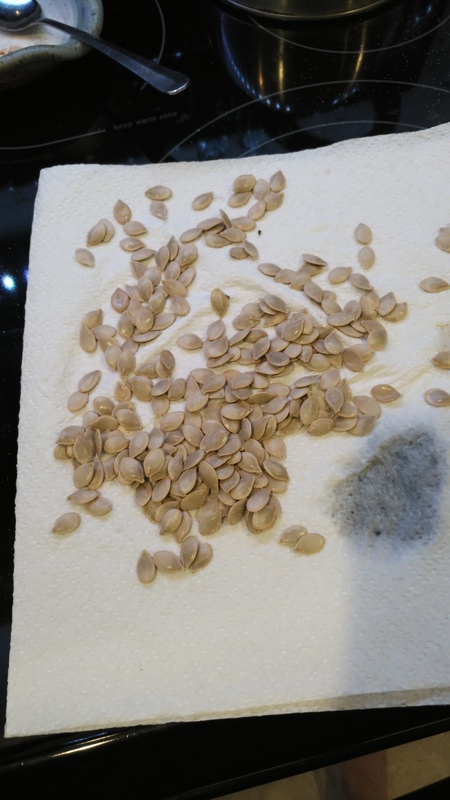 NEVER THROW OUT ACORN SQUASH SEEDS. Time to get roasty toasty. 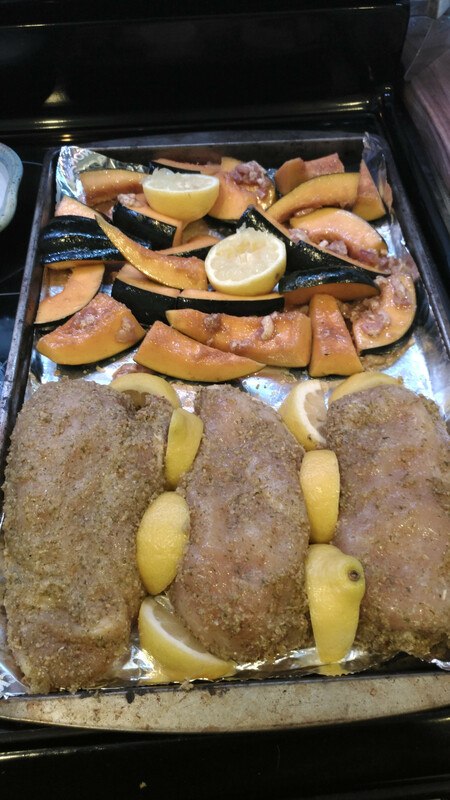 Preheat oven to 425 and spread squash and chicken onto a foil lined baking sheet. 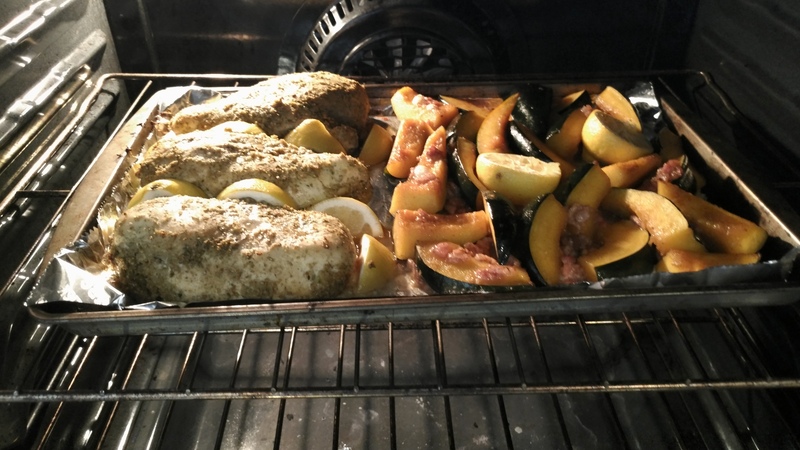 Bake for 25 minutes, or until the thickest part of the chicken breast reads 155. Finish under broiler to get everything nice and browned. 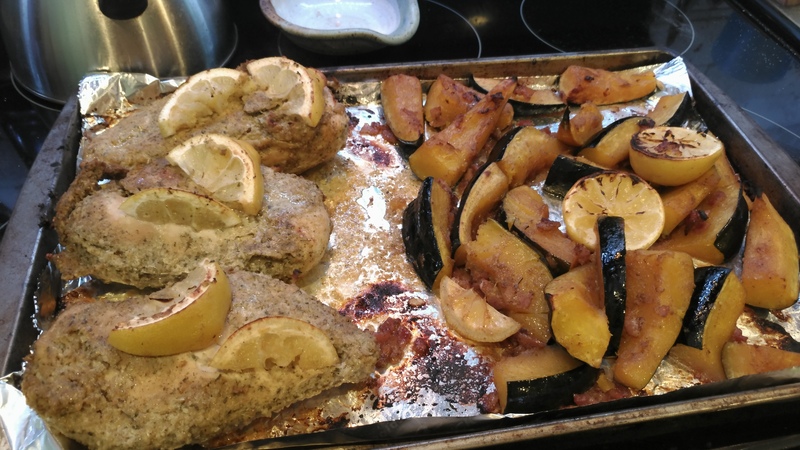 Finish Acorn Squash with a squeeze of the half of a roasted lemon. 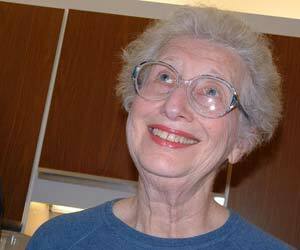 Pray again to gelatin gods, sharpen and wet a knife to try and neatly slice your set tea lemon. 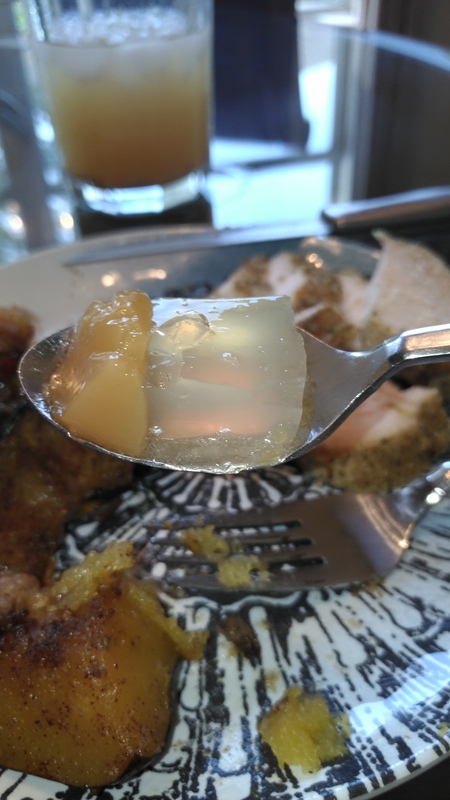 The gelatin gods are kind! And cruel, because you drop the tea jelly in the sink and you're warming the Tupperware to try and unset the jelly. BUT IT'S FINE, you rescue most of it, the sink was clean. Unset and cube gelatin, decorate with tea lemons. I wish I had bluer plates. 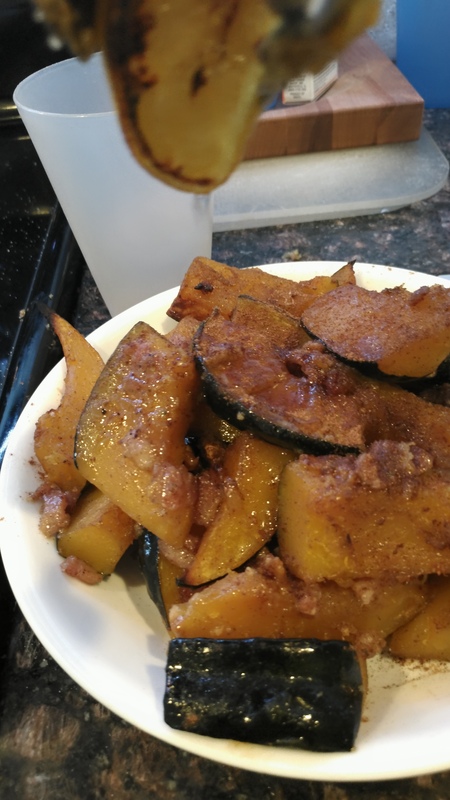 Also, acorn squash is filling as heck. Tasted nice with butter, I honestly didn't think it needed or benefitted much from the bacon. 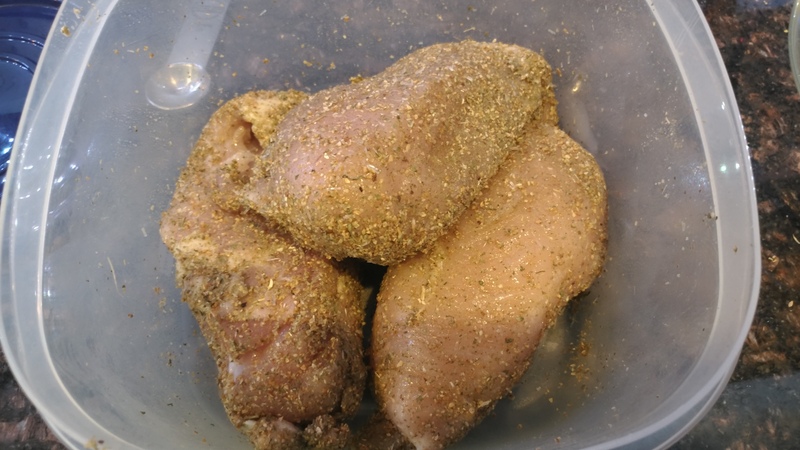 The chicken was a bit dry, I should have flattened out the thickest part of the breast a bit. 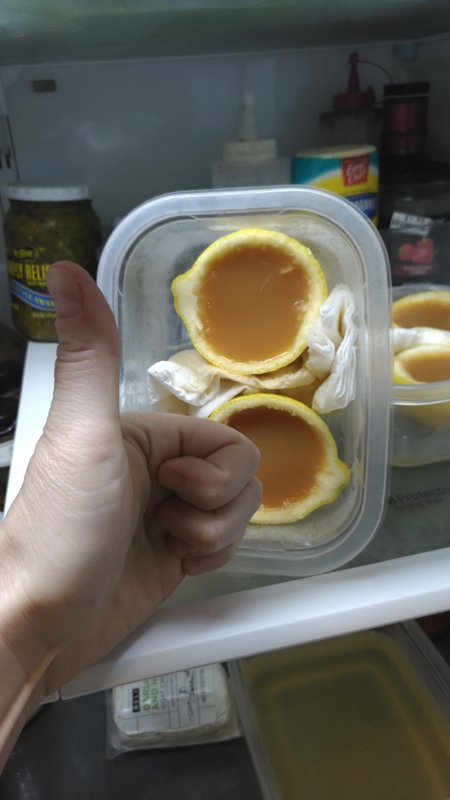 It was perfectly fine and edible, but I dont think I'd lemon it again. It was a bit much for a hot dish. 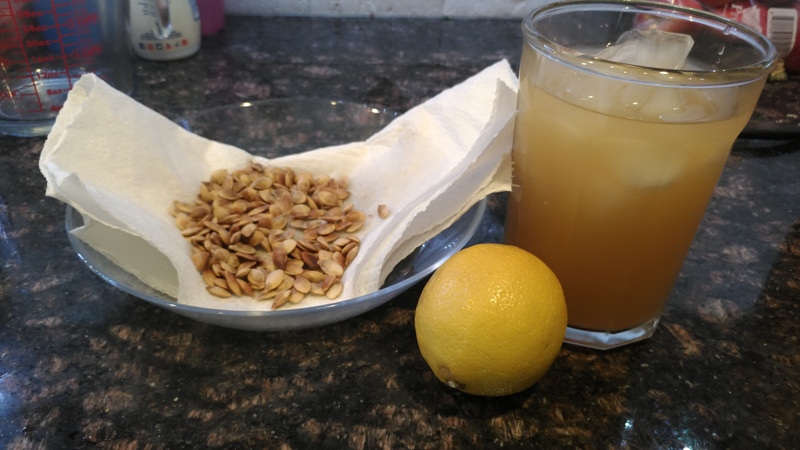 The Arnold Palmer Gelatin is honestly my favorite part (besides the roasted seeds). I never liked Jello growing up, and thought all gelatin was going to taste like that. Boy was I wrong! This is nice and flavorful, without the empty watery taste of jello. I am gonna play with gelatin more often. What do we tell the gods of leftover chicken breast? Sazonador Total is so well named. I put that on everything. Well, Mulan stole the leftover acorn squash off the table today and ate all of it.